I'm not a huge fan of lemon desserts but when I came across this lemon cake recipe on An Italian in My Kitchen's Blog something told me I needed to make this. Maybe it was the beautiful photos or the word Italian in the recipe name...whatever it was I'm so glad I made it. What is it that I love so much about this cake...well absolutely everything! The crumb is just how I like it; light and airy. It has a slight hint of lemon, not to overpowering. And it's one of those cakes that can be enjoyed any time of day, even for breakfast. It's a simple cake that would be a wonderful base for other great flavors. Pre-heat oven to 350° (180° celsius). Lightly grease and flour an 9 1/2 inch bundt cake. In a large bowl beat on medium speed eggs and sugar until light and fluffy. Melt butter and let cool completely. Grate the peel of one lemon. In a medium bowl whisk together flour,baking powder and salt, then alternating with the cream gently fold into egg mixture with a spatula, keep folding until mixture is combined, gently fold in lemon peel, vanilla and melted butter, pour into prepared pan and bake for approximately 40-45 minutes. This cake looks absolutely perfect!! I love a good lemon cake with a light and airy crumb. This cake will be perfect served with fresh berries! 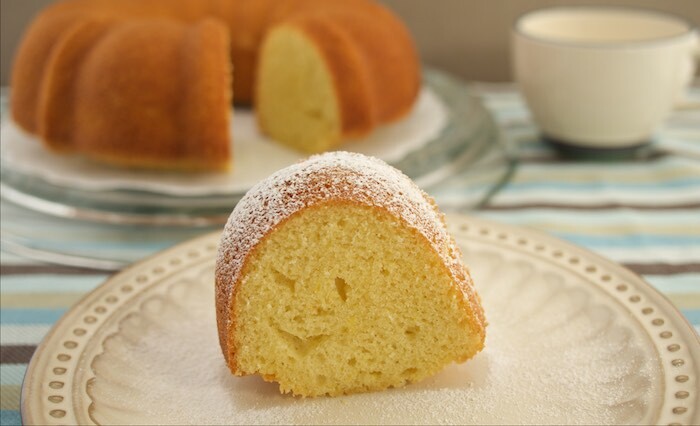 I love lemony baked goods, especially when they are light and airy like this. Yum. Sounds like a simple and delicious cake! I absolutely love lemon cake! It's one of my favorites during the spring. This looks lovely! I'm a huge fan of lemon desserts and think this looks great! What a classic recipe. Pinned! I love anything lemon and I know this is delicious. Your cake looks so moist and lovely! This looks delicious. I love everything lemon. I'll bet this is super moist with all that cream. I love it! This sounds really fantastic! Love lemon in dessert! I really like that it has a "light" lemon flavor - it looks delicious! Looks easy to make and light n' airy. What a wonderful cake. I love the light lemon flavor. What a treat this would be - just delicious!